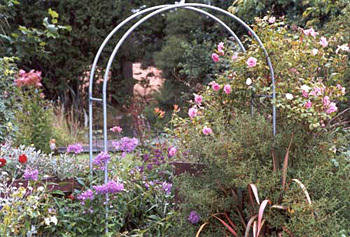 The original plan was for the beautifully scented red climbing rose Etoile de Hollande to gracefully grow through and embrace this arch from the left, while Bantry Bay and White Sparieshoop roses did ditto from the right. These roses have been somewhat disappointing - blame that thuggish Clematis, maybe? Etoile de Hollande didn't make it past the planting season. 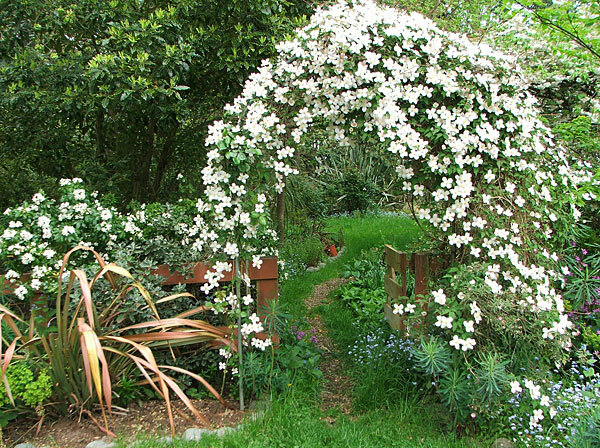 After a suitable time of mourning the red climber Parkdirektor Riggers was installed, and I had high hopes that this beauty would eventually cover the archway curves. Hmm... The Parkdirektor has been on a go slow ever since. The pink climbing rose Bantry Bay, growing from a cutting, did survive. Phew! 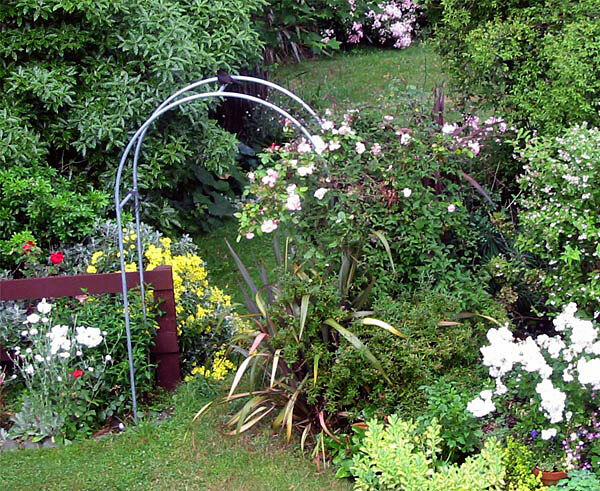 Actually Bantry Bay in my garden tends to be a beautiful late spring rose, but doesn't weather the summer at all well. Some plantings at the base of the Pond Paddock archway have caused trouble, too, by growing over the path through the archway. The yellow flowering Senecio has to have a huge trim every three years or so, and hybrid red Phormiums have come and gone. The latest is a Jester variety, but it keeps on getting sliced to pieces by the lawn mower. Someone planted it too close to the edge of the border. A Cistus with smallish pink flowers has been drastically pruned, hopefully in the correct season (immediately after flowering). the red rose Dublin Bay was banished because of rust, and the white single rose Sparieshoop has just disappeared. When did that happen? Pansies and lime Nicotianas self-seed here each year. In spring there are daffodils and clumps of forget-me-nots, and the lily Vivaldi appears in mid-summer. Apart from Bantry Bay the roses have been underwhelming. I totally blame that Clematis montana! But look how beautiful it is in late spring. 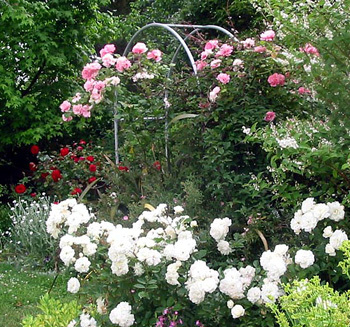 As long as I prune it drastically after flowering, and stop it strsngling the other shrubs, all can be forgiven.